Kazoopa is coming, and I can safely say I've never been more excited for a festival in my entire life. The line up is to die for, and with my good friends Mick Dolman and Chantel Littlewood of Double Denim Live at the helm, it's bound to be a fun-filled day to remember. The line up boasts some of my absolute favourite bands... Judas, The Doldrums, The Barmines, The Jackobins... the list goes on, but as exciting as seeing them will undoubtedly be, one thing's for certain; you can always count on Mick & Chantel to showcase the best of up and coming musical talent from all across the country and I'm quite sure that I'll discover a number of incredible new bands throughout the course of the day. 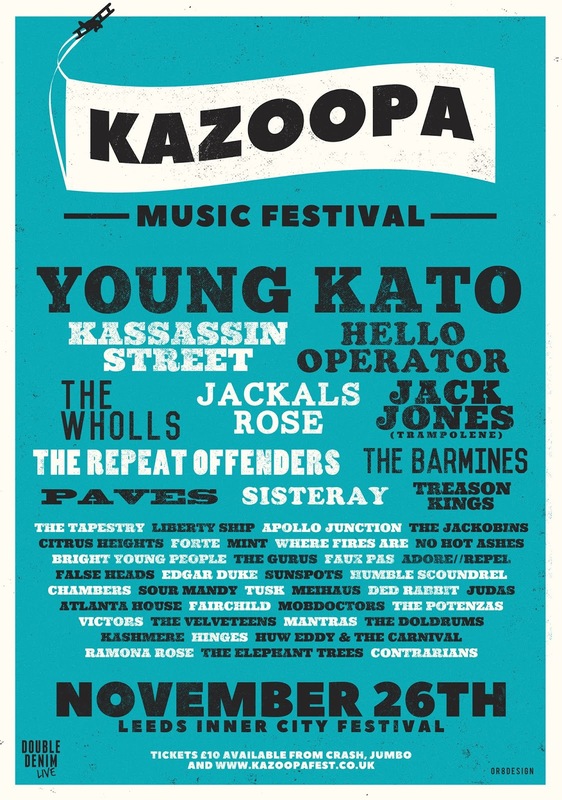 The Leeds music scene is on fire at the moment, and it's not just because of the bands; the venues themselves are an asset to the city and Kazoopa will take place at a number of our most exciting and intimate music venues. The main stage will be located at Headrow House, and having attended a number of gigs there I can confirm that it's a really great place. The other stages will be located across Leeds at Verve Bar, Oporto, Milo Bar and Santiago Bar. I've already started working on my own little festival schedule, complete with who I want to see, where they're playing and at what time; the most difficult part of any festival is the all important decision of who to choose when there are clashes... we've all been there, but as soul destroying as it is, it's unavoidable when there are over 50 bands playing over the course of a single day. It's times like these I wish I had a Harry Potter style time turner! I've chosen four bands that I urge you to check out on the big day, all of whom are completely and utterly brilliant in their own right. York is my absolute favourite city, and not just because I'm a bit of a history geek; there have been a fair few really great bands emerging from it's ancient city walls of late, one of which is the brilliant Faux Pas. I've been lucky enough to see them live a number of times and every time I do, they've upped their game. They've had a pretty impressive Summer, having played at a number of high profile festivals including Reading & Leeds. For such a young band, they never fail to give a polished and professional performance. They're opening up the main stage at Kazoopa, and I'm almost certain that this will see them add to their already impressive following. If it's slick, powerful grunge-rock that you're after, then Hello Operator are the band for you. Another of York's talented exports, they're the kind of band that once you've seen them, you never forget them. They can often be found touring relentlessly up and down the country, and it's that admirable work ethic and dedication that's seen them receive acclaim from media outlets galore, including BBC Introducing. Leeds' very own masters of psyche-rock, I for one am seriously excited to see what this band have to offer at Kazoopa. There's not a great deal in the way of music available to listen to online, but their debut release "I'm So Vanilla" is so silky smooth and infectious that on first listen alone, it becomes cemented in your brain. A last minute addition to the bill, but an incredibly exciting one. This Southsea based five-piece have been making serious waves this year with their very own creative blend of edgy psychadelic rock that you can't help but move your feet to. They're completely different to anything I've ever heard before, and probably my top pick for Kazoopa 2016. Tickets for this, the very first Kazoopa Festival, are on sale now for just £10 plus a small booking fee at http://www.kazoopafest.co.uk/tickets/. There's going to be a very special launch party on Friday 25th November, featuring yet more fantastic bands such as The Rook and Dirty Stirling. There will also be an after party on the day itself, details of which will be released at a later date. This is going to be one VERY special weekend, and you can be a part of it. Grab your ticket while you can!